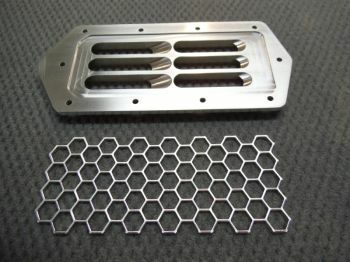 Aluminum cnc intake grate with added screen for extra protection for the impeller. 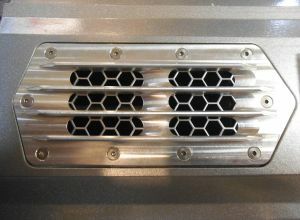 The aluminum screen comes with the CNC grate but doesn't have to be used unless you are running in debris filled water. Using the screen will reduce speed by about 3-4 mph. The reduction of speed comes with the added benefit of protection from the jet picking up large debris. If all out speed is what you're after then run the grate without the screen. 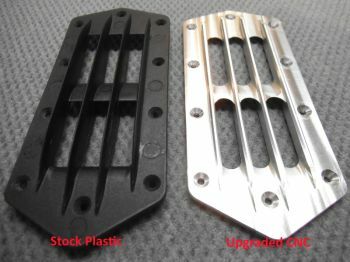 The second pic shows the stock versus cnc grate. The stock part has the loading ramps flush with the bottom of the grate, my grate has the center loading ramps 1/16 inch lower than the bottom of the grate, this allows it to scoop more water in and re prime faster in rough water. 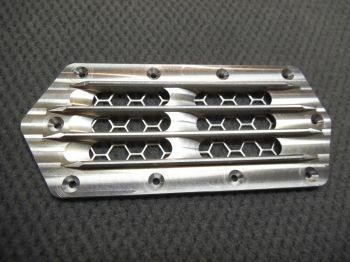 The 4th pic shows the screen pocket and screen, as mentioned before you can run the grate with or without the screen.